Have you ever seen a bird flying over a blog or site? may be you have seen it before because many bloggers and site owners are using this gadget in their blogs and sites. 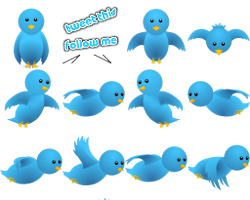 Tweeting and following via simple buttons is now old, bloggers are using smart gadgets like flying twitter bird or floating buttons for tweeting and following on twitter. This widget not only makes your blog look smarter but also helps you to get more tweets and followers as it attracts visitors. (1). Go to Blogger, log-in to your blogger account and open your blog. (3). Click anywhere in the Html and find </body> by using Ctrl+F on your keyboard. (5). Replace 101Helperblog with your twitter username in the code. (6). Click on Save template and you are done successfully. Open your blog to see flying twitter bird. This gadget can't be customized as it is a very simple gadget, you can't customize its flying speed, its color or anything else. I hope you like this gadget, if you have any problem in adding this gadget or this gadget is not working on your blog ask me in comments. Follow by E-mail and subscribe to 101Helper to get latest news about blogger gadgets or follow on Twitter, Facebook and Google+ to stay in touch with 101Helper. Tags: Twitter flying bird for blogger, twitter follow gadgets, tweeting, twitter, twitter gadgets for blogger, twitter follow buttons, smart gadgets for blogger blog, 101Helper gadgets for blogger.